How to use COLUMNS_UPDATED to check if any of certain columns are updated? I have table with 42 columns and a trigger which should do some stuff when 38 of these columns are updated. So, I need to skip the logic if the rest 4 columns are changed. I can use UPDATE() function and create one big IF condition, but prefer to do something shorter. Using COLUMNS_UPDATED I can check if all of certain columns are updated? So, value 20 for column 3 and 5, and value 1 for column 9 because it is set in the first bit of the second byte. If I change the statement to OR it will check if columns 3 and 5 or column 9 is/are updated? How can apply OR logic in the context of one byte? You can use CHECKSUM() as a fairly simple methodology for comparing actual values to see if they were changed. CHECKSUM() will generate a checksum across a list of passed-in values, of which the number and type are indeterminate. Beware, there is a small chance comparing checksums like this will result in false negatives. If you cannot deal with that, you can use HASHBYTES instead1. The example below uses an AFTER UPDATE trigger to retain a history of modifications made to the TriggerTest table only if either of the values in the Data1 or Data2 columns change. If Data3 changes, no action is taken. If you're insistent on using the COLUMNS_UPDATED() function, you should not hard-code the ordinal value of the columns in question, since the table definition may change, which may invalidate hard-coded value(s). You can calculate what the value should be at runtime using the system tables. Be aware that the COLUMNS_UPDATED() function returns true for the given column bit if the column is modified in ANY row affected by the UPDATE TABLE statement. This demo inserts rows into the history table that perhaps should not be inserted. The rows have had their Data1 column updated for some rows, and have had the Data3 column updated for some rows. Since this is a single statement, all rows are processed by a single pass through the trigger. 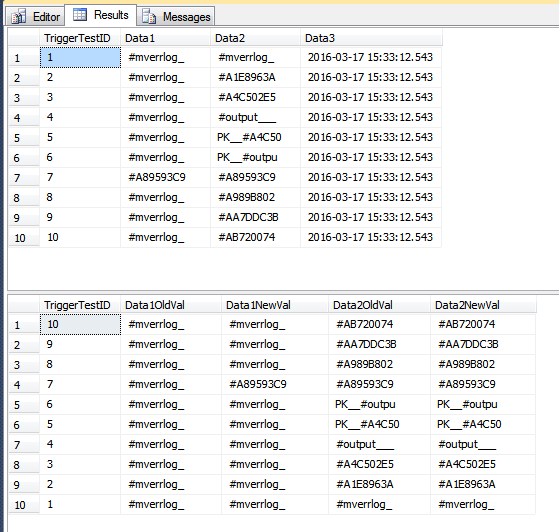 Since some rows have Data1 updated, which is part of the COLUMNS_UPDATED() comparison, all rows seen by the trigger are inserted into the TriggerHistory table. If this is "incorrect" for your scenario, you may need to handle each row separately, using a cursor. The TriggerResult table now has some potentially misleading rows that look like they don't belong since they show absolutely no changes (to the two columns in that table). In the 2nd set of rows in the image below, TriggerTestID 7 is the only one that looks like it was modified. The other rows only had the Data3 column updated; however since the one row in the batch had Data1 updated, all rows are inserted in the TriggerResult table. 1 - see https://stackoverflow.com/questions/297960/hash-collision-what-are-the-chances for a discsussion of the vanishingly small chance that the HASHBYTES calculation may also result in collisions. Preshing has a decent analysis of this problem as well. Not the answer you're looking for? Browse other questions tagged sql-server t-sql trigger or ask your own question. How can I avoid repeating the same condition in a “when matched then update” clause? Is any caching mechamism used for non-persisted computed columns?